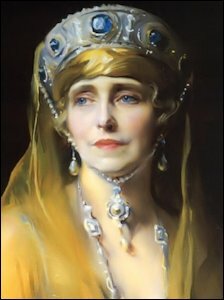 Queen Marie of Romania (1875-1938), daughter of Alfred, Duke of Edinburgh, the second son of Queen Victoria, and Grand Duchess Marie Alexandrovna, the only daughter of Tsar Alexander II of Russia, was both a patron and devotee of the arts, as well as an artist in her own right. Said to have inherited her grandmother, Queen Victoria’s talent for drawing, she also pursued sculpture, and was a prolific author: The Dreamer of Dreams, Miracle of Tears, A Christmas Tale, in addition to historical, autobiographical, and diary volumes. 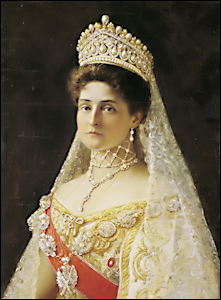 Marie became Crown Princess in 1893 when she married Crown Prince Ferdinand of Romania (1865-1927). He became King Ferdinand I and she the Queen Consort of Romania on the death of King Carol I in 1914. Their coronation took place on October 15, 1922. “No royal guest who has ever visited America has been so widely acclaimed for her beauty as Queen Marie. Youth is hers-and great vitality, in spite of years crowded with strenuous activity. She has a beautiful skin-unlined, firm, fresh, with lovely natural color! A skin which speaks for itself of the wise care Her Majesty has always given it. Over two years ago, Her Majesty, writing from Bucharest, was pleased to permit the Pond’s Extract Company to quote her words expressing her faith in the efficacy of Pond’s Two Creams. Kristin Mills, Houston, attempted to redeem the ‘coupon’ at the New York City address. The amusing response she received was that they did not have time to help with ‘school projects’. I sent a historical inquiry to Unilever, London. The company acquired Ponds in 1986 and Fabergé in 1989. No response was forthcoming. In the Artie and Dorothy McFerrin Collection on view at the Houston Museum of Natural Science in Texas, a Fabergé brooch with the distinct monogram designed by Crown Princess Marie of Romania using her artistic talent is featured on a lozenge-shaped brooch/chiffre. The sketch dated to 1896 incorporates a stylized M below the Romanian crown, and the brooch is hallmarked 1899-1908 for the Moscow workshops of Fabergé. This suggests the chiffre was made before Marie became Her Majesty, The Queen of Romania in 1914. It appeared on the auction market – Sotheby’s Geneva, November 16, 1989, Lot 418, with a later case stamped Wartski, and in 2006 was on loan from a private collection to the Wartski London venue, Fabergé and the Russian Jewelers: A Loan Exhibition, item 228. The historical details to whom the pin was presented are unknown at this time. Against the bright blue sky outlined. Across the plain its great hooves thunder…. It fixes them with glassy stare. Cries loudly, for the Head to hear him. “He who betrayed you is undone! And in it roused new, fresh-born feeling. All of its anguish, moaned and sighed. Stared, full of venom undisguised. 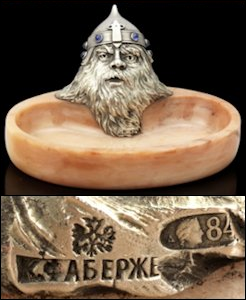 A silver-mounted hardstone pin tray offered for sale by Bonhams London during the 2015 Russian Art Week belongs to a rare group of Fabergé objects from the Moscow workshops inspired by traditional folklore. In this instance, the designers turned to the epic poem of Ruslan and Ludmila published by Alexandr Pushkin in 1820, then transformed into an opera by Mikhail Glinka in 1842. The subject matter dove-tailed perfectly with the revival of pro-Russian sentiment gripping mid-19th century Moscow and would have certainly resonated with the affluent industrialists and merchants who flocked to Fabergé’s shop as a purveyor of luxury goods. Whilst still a student himself, Pushkin drew upon fairytales from his childhood for the adventures of a Russian warrior hero who searches tirelessly for his wife Ludmila, abducted by the evil wizard Chernomor. 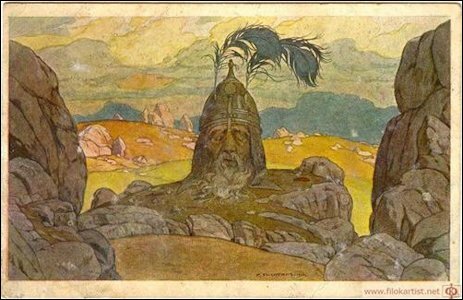 The quest by Ruslan leads him to a hill which reveals itself to be Golovo, the giant severed head of Chernomor’s brother. Ruslan initially attacks the head, but is persuaded to take up a magical sword and join forces to fell Chernomor in order to avenge the wizard’s brutality. The opera with the same name was produced in 1842 at the Bolshoi Kamenny Theatre in St. Petersburg and again in 1846 at the Moscow Bolshoi Theatre, where it has since been performed several hundred times. An early 20th century production at the Marinsky Theatre featured set designs by Konstantin Korovin. Other artists such as Ivan Bilibin (illustration above) and Nikolai Ge depicted Golova so the form was familiar to Russian audiences. 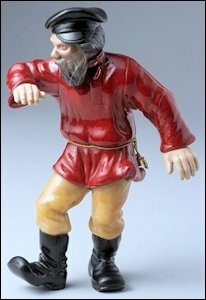 The Bonhams’ dish comprises a silver head with Golova’s characteristically full eyebrows and beard. 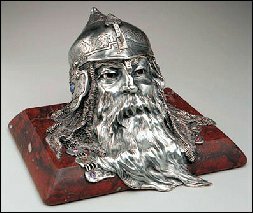 He wears a traditional helmet set with cabochon sapphires and perches upon a base of aventurine quartz. 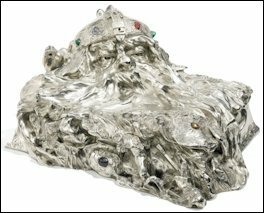 The composition is reminiscent of an inkwell formed as a silver head upon a marble stand (Christie’s New York, October 20, 1998, Lot 37). Both relate to yet another version, also modeled in high relief but this time formed as a casket (Sotheby’s London, June 3, 2014, Lot 656, see additional details in a video in Auctions below). All three depictions of Golova are distinctly different in appearance despite sharing the same source of inspiration. 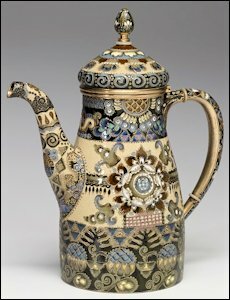 Although we do not know the precise circumstances that led to the group drawn from Ruslan and Ludmila, they are among Fabergé’s most distinctively Russian objects: Not only is the subject matter home-grown, but the references to traditional jewelry techniques in the cabochon sapphires and the unabashed celebration of indigenous hardstones all point inwards to native traditions and well away from the West as ultimate arbiter of taste. Christie’s Daily offers news, views and expert insights from the Art People. A recent offering included an advertisement for a Fabergé documentary and in the last segment stunning Fabergé auction lots offered during the Spring 2015 auctions. 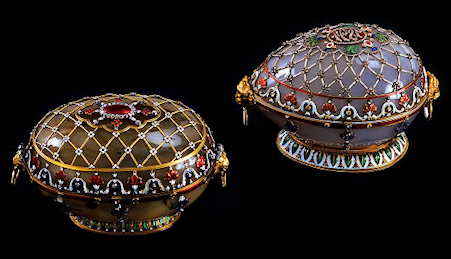 Darin Bloomquist, Head of the Department of Russian Works of Art, narrated two 2014 videos with Fabergé auction highlights – a gem-set silver casket based on the Pushkin’s epic poem Ruslan and Ludmila and three imperial gifts. 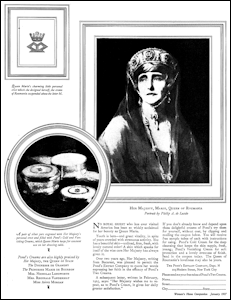 The Russian Sale includes a Fabergé hardstone pin tray discussed in the feature story above. The Readers Forum of the Fabergé Research Newsletter continues to elicit interesting challenges. In the Winter 2014 edition Tatiana Muntian’s discovery of previously unknown costs for “Fabergé Easter Eggs for 1912, 1914, and 1915”, and a chart compiled by Riana Benko ranking the “Cost of Easter Eggs, 1900-1915” were published. Two readers posed questions relative to the data presented. Kieran McCarthy, Wartski, London, suggested — There was considerable inflation and devaluation of the ruble in the early 20th century. I wonder if the index adjusted prices for the eggs would give the same ranking order? Will Lowes from Australia wrote – There is a problem with the cost of these later eggs, given the new information presented by Tatiana Muntian in her article to mark the 400th year of the Romanov dynasty. (“Symbols of a Vanished Empire,”символы исчезнувший империи, Antiquariat, December 2013, 10-15. In Russian). Her documentation says the Napoleonic Egg cost 22,300 rubles. In Lowes and McCanless, Fabergé Eggs: A Retrospective Encyclopedia, 2001, 119, the authors state ‘the 1912 Napoleonic Egg and the 1912 Tsesarevich Egg cost a total of 50,897 rubles, 50 kopecks’. We cite unspecified accounts books and correspondence. If this truly specific figure — right down to the 50 kopecks — is correct, then (given Muntian’s new figure for the Napoleonic Egg) the Tsesarevich Egg cost 28,597 roubles, 50 kopecks. This would not surprise, given the number of diamonds studded on it — and the very subject of the item — the Tsesarevich, the heir to the throne, so precious to Alexandra Feodorovna and Nicholas II. Armand Hammer, admittedly never noted for accuracy, did say it was worth 100,000 rubles, again probably because of the diamonds. It would make the Tsesarevich Egg the most expensive egg, certainly more than the Mosaic Egg. While there is incredible workmanship in the Mosaic Egg, most of the gems are very small and not especially valuable. And the value of the labor in making it, may not have surpassed the value of the diamonds of the Tsesarevich Egg. Remember the politics involved, namely, that a female could not ascend to the throne. The Tsesarevich Egg would surely surpass the Mosaic in value, politically as well as in hard cash. At my request Riana Benko generously agreed to gather known data to shed some light on the topics summarized above. Published Fabergé literature and Internet resources compiled in Table I below state the cost of the eggs in rubles (r.) and converting them to the value in dollars ($) at the time of creation of each egg, and then again in 2014 $ values. In Table II the same data is converted into a ranking from the most expensive to the least expensive egg in terms of 2014 dollars. Average Russian worker’s annual salary in 1885 was circa 30.5 r. The 1885 First Hen Egg by Fabergé cost 4151 r., or an equivalent of 136 years of average earnings. The cost of the 1913 Romanov Tercentenary Egg at 21,300 r. compared to the annual average salary (37.5 r.) equates to 568 years for one egg! In contrast, the annual income of an aristocratic nobleman was about 6,000 r., or more than the price of one egg for the years 1890-1895. Click HERE for a printable PDF of the above chart. Fabergé, Tatiana, Proler, Lynette G., and Valentin V. Skurlov, Fabergé Imperial Easter Eggs, 1997. Lowes, Will, and Christel Ludewig McCanless, Fabergé Eggs: A Retrospective Encyclopedia, 2001. Updates for the encyclopedia entitled Fabergé Imperial Egg Chronology are being published on the Fabergé Research Site. Zimin, Igor Viktorovich, and Alexander Sokolov Rostislavovich, Jewelry Treasures of the Russian Imperial Court (ювелирные сокровища российского императорского двора), 2012. In Russian. 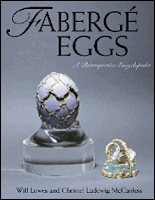 Fabergé Research Newsletter, Winter 2014 and Summer 2015. Click HERE for a printable PDF of the above table. 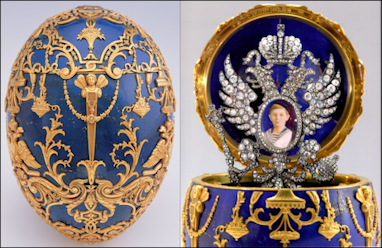 Maria Feodorovna received 30 Fabergé Easter eggs valued at 230,465 r./$127,737, or $3,244,613 in 2014. Alexandra Feodorovna received 20 Fabergé Easter eggs, valued at 222,780 r./$114,928, or $2,919,328 in 2014. 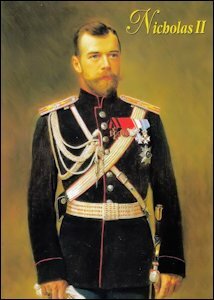 Nicholas II, the last Russian Emperor was the fifth wealthiest man in the world. In 1917, his wealth was estimated at some $900 million, close to $16.5 billion in 2014 values. 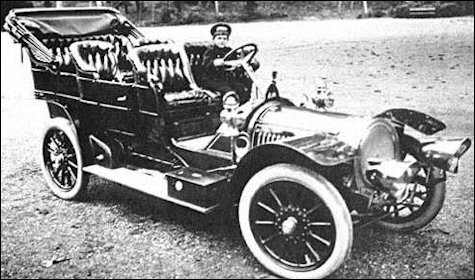 1905 Emperor Nicholas II bought his first car a cost of 18,400 r./$14,154 ($367,262). 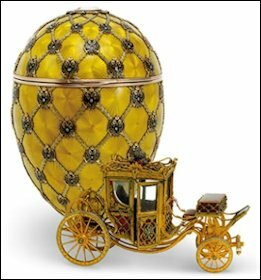 A year later Fabergé made the Moscow Kremlin Egg for Alexandra Feodorovna and the Swan Egg for Marie Feodorovna, costing a total of 19,000 r., or as much as the Emperor’s first car. 1909 Nicholas II purchased another new car costing ca. 16,000 r./$12,308 ($319,468 in 2014). Fabergé’s made the Standart Egg for the Emperor’s wife and the Alexander III Commemorative Egg for his mother that year, totaling 23,600 r., or $12,165 ($315,757 in 2014). Today the 1897 Coronation Egg in the collection of the Fabergé Museum, St. Petersburg, Russia, is probably the most recognized egg of the Imperial Easter Eggs by Fabergé. It ranks only no. 37 in 2014 dollar values of $79,411. The 1913 Winter Egg (ranked the 4th most expensive egg) sold at auction in 1994 for ca. $5.6 million, and in 2002 for ca. $9.6 million. 2014 values for Maria Feodorovna’s 30 eggs total ca. $3.2 million, and Alexandra’s 20 eggs $2.9 million. Ms. Benko thanks Prof. Igor Zimin and Dr. Valentin V. Skurlov for their assistance in the reviewing the tables. DeeAnn Hoff and George McCanless assisted in fact/figure-checking. Description: “Easter Egg of white enamel egg, the crown is set with rubies, diamonds and rose diamonds-4,151 rubles (including 2 ruby eggs-2,700 rubles)” appears in a handwritten list of the Imperial Easter eggs from 1885 to 1890 made by N. Petrov, the assistant manager to the Cabinet of His Imperial Majesty. The list was located in the Russian State Historical Archives in St. Petersburg and cited by Marina Lopato in Apollo, January 1984. The gold shell of this simple but historic piece is enameled opaque white and polished to resemble a hen’s egg. The two halves are joined by a bayonet fitting (Editor’s note: a type of attachment in which a cylindrical part is pushed into a socket and twisted slightly so that it is secured by engagement of the parts). 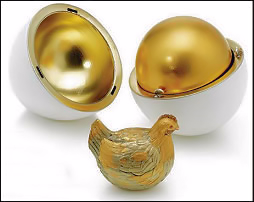 They open to reveal a matt gold yolk containing a nest of chased yellow gold straw in which sits a naturalistically chased varicolored gold hen with ruby eyes. In the tail feathers is a hinge on which the hen opens horizontally when the beak is lifted. Originally contained within was a diamond replica of the Imperial crown, which concealed a tiny ruby pendant suspended within it. The present whereabouts of these tiny surprises, identified from archival black and white photographs, is unknown (Waterfield & Forbes, 1978). Background Notes: There had been an ongoing debate as to the actual year the egg was created, and at whose instigation. Fabergé’s son, Eugène, maintained the egg was made in 1884, but others believed the year was 1885, or even 1886. Marina Lopato’s research published in Apollo, January 1984, suggested 1885 was the correct year, when official court documentation was discovered in the Russian State Historical Archives in St. Petersburg. Later, she took the view (von Habsburg & Lopato, Fabergé: Imperial Court Jeweller, 1993) that the archival description was of a second, more elaborately jeweled egg. However, Fabergé, Proler, & Skurlov reported in Fabergé Imperial Easter Eggs (London, 1997), an exchange of letters between Tsar Alexander III and his brother, the Grand Duke Vladimir Alexandrovich, which settles the issue beyond doubt. Obviously the tsarina was delighted, for a tradition had begun that would become the zenith of the decorative arts in the Western world. While these letters explain when the tradition started, the reason why is still not known. The last sentence of the tsar’s letter suggests there was a specific reason for the gift. H. C. Bainbridge was adamant that Fabergé approached the tsar with the idea (Presentation of Imperial Russian Easter Gifts by Carl Fabergé (New York), and Hammer Galleries exhibition catalog, September 8 – November 30, 1939). Mogens Bencard in the exhibition catalog, Maria Feodorovna, Empress of Russia (Copenhagen, 1997), believes there was a meeting between Fabergé and the tsarina (and not the tsar) before the egg was made. Suggestions have been made that Armand Hammer took the Tsar Imperial First Hen Egg out of Russia. Indeed, Hammer himself claimed to have done so. However, the egg Hammer purchased was sold to Matilda Geddings Gray and is still in the Gray Foundation Collection. 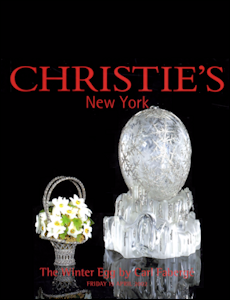 It is not the egg sold at the Christie’s auction in London on March 15, 1934, which is the first Tsar Imperial egg. Further detail can be found under ‘Crown Egg’ in the first two citations listed above. A. Kenneth Snowman pointed out a similar egg exists in the Danish Royal Collection, which may well have been known to Marie, formerly the Danish Princess Dagmar. 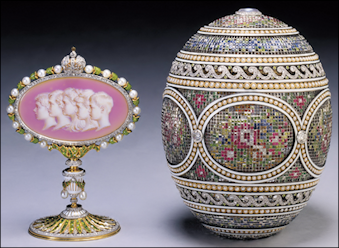 Fabergé made a number of other eggs similar to the First Hen Egg. Géza von Habsburg in “Fabergé’s Imperial Eggs – Their Inspirations and Prototypes” (Fabergé Research Newsletter, Fall 2013) discusses several prototypes for this egg. The egg retains its original velvet case; the stand is modern. And yet, existing literature dated the egg at 1895, probably because that date had been written in ink on the velvet case. We know from the memoirs of François Birbaum in von Habsburg & Lopato, Fabergé: Imperial Jeweller (London, 1993) Tsar Alexander III had laid down broad rules relating to the eggs: that the egg shapes continue, but that there be no repetitions. With this in mind, there surely cannot be two eggs in pink enamel in the Louis XVI style, especially within five years of each other. The date 1895 was probably written on the egg’s case during the 1922 inventory of confiscated Imperial treasure. It seems the real 1895 gift, the Blue Serpent Clock Egg, was not among the eggs listed in this inventory or that of 1917, and an assumption regarding the egg was made at that time. Proof that the Danish Palaces Egg was made before 1895 is available from a list made when the Imperial couple traveled, taking with them items from Gatchina Palace: “Egg consisting of 10 pieces (small folding screen). His Majesty took it to Petersburg on 31 December (OS), 1891, and returned it on 28 March (OS), 1892.” (Fabergé, Proler, & Skurlov, Fabergé Imperial Easter Eggs, London, 1997) It is definitely identified in the 1917 inventory of confiscated Imperial treasure and possibly in the inventory made in 1922. 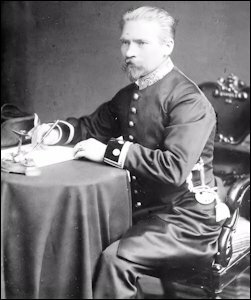 In 2008 research by Annemiek Wintraecken and Steener Eriksen they found other documentation in which Alexander III expressed a wish in September 1885 to have his own residence in Fredensborg. Petrel’s Nest, a property in the palace gardens was bought, refurbished, and opened with a tea-party on October 1, 1889. Marie Feodorovna baptized the building and described it as ‘Our dear miniature Gatchina’. The house became known as the Kejserens Villa (Emperor’s Villa). In October 1980, the Egg was stolen while on exhibition at the Paine Art Center and Arboretum in Oshkosh, Wisconsin. It was recovered soon after, following a high-speed police pursuit, during which it was jettisoned with two other Tsar Imperial eggs, the 1893 Caucasus Egg and the 1912 Napoleonic Egg. Description: The egg is carved from a solid piece of heliotrope jasper (Editor’s note: also known as bloodstone), flecked with red and blue. It is decorated in the Louis XV style with yellow gold rococo scrolls set with brilliant diamonds and chased gold flowers; the broad flute gold bezel is set with a drop ruby clasp. The interior of the egg is lined with green velvet. 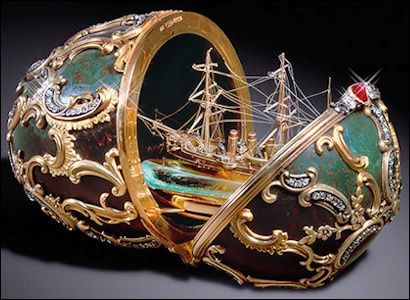 The egg contains an exact replica of the cruiser In Memory of the Azov, executed in red and yellow gold and platinum, and with portholes set with small diamonds. The name Azov appears on the stern of the ship, which rests on an aquamarine plate representing water. The plate has a golden frame with a loop, enabling the model to be removed from the egg (Brezzo, et al., 1989). A second blow was parried by Prince George of Greece, the second son of King George I of Greece, who fended off the attack with his cane. George, a boyhood friend of Nicholas, had joined the eastern adventure in Athens, where the Russian princes stopped before traveling east. Nicholas told Marie Feodorovna: “I stopped and turned round and to see dear Georgie about ten paces from me, with the policeman, whom he had knocked to the ground with one blow of his cane, laying at his feet. Had Georgie not been in the rickshaw behind me, dearest Mama, perhaps I would never have seen you again!” Nicholas was left permanently scarred both physically and mentally, and the incident poisoned his view of the Japanese, whom he described in private as “monkeys.” The Ōtsu incident probably played a role in the Tsar’s ill-fated decision to go to war against the Japanese 13 years later. 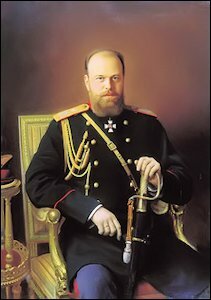 Blood from a handkerchief used to staunch the Tsesarevich’s wound was used 100 years later in the earliest DNA testing done to positively identify the body of Nicholas II. 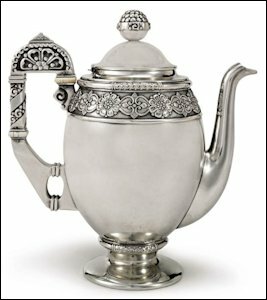 Other judges, including Victor Champier and the noted enameller Louis Houillon, were more enthusiastic about Fabergé’s work. 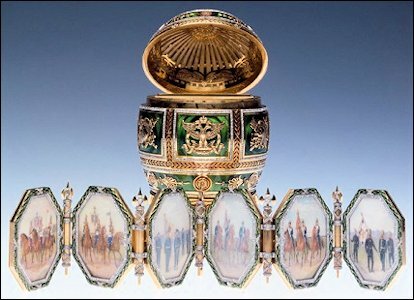 In any event, the Exposition brought Fabergé and his work to the notice of the world. The Memory of Azov Egg is readily identifiable in both the 1917 and 1922 inventories of confiscated Imperial treasure. An expert valuation was made of this egg in 1927. Found by Fabergé, Proler, & Skurlov, the valuation noted the mast was damaged, one rose-cut diamond was missing, and there was “a noticeable crack in the jasper.” The egg’s worth was assessed at 8,880 rubles. With the 1902 Clover Leaf and 1906 Moscow Kremlin Eggs, this egg was scheduled for sale to the West. They were returned to the Armoury, following protests from workers and management within the Armoury. 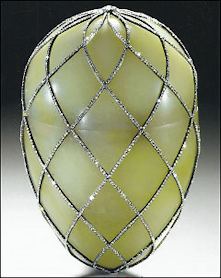 Description: Carved from semi-precious bowenite, a member of the serpentine family of minerals, (Editor’s note: Some Fabergé literature incorrectly identified the stone as pale green jadeite) with yellow and white markings, the egg is enclosed in a lattice of rose-cut diamonds with gold mounts. The egg is hinged and set at the apex with a large diamond. 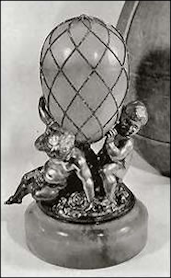 Originally, the egg was supported on the backs of three silver putti, seated on a grassy mound with roses on a circular bowenite base. This base is described in the December 5, 1960, Sotheby’s London auction catalog as bearing the English import mark of 1908. However, Fabergé, Proler, & Skurlov in Fabergé Imperial Easter Eggs (1997) suggest the base is original. A list of Tsar Imperial eggs kept at the Gatchina Palace in 1891-92 gives details of the Diamond Trellis Egg, and its long-missing surprise. 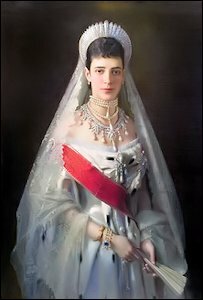 Background Notes: Marina Lopato’s archival research at the Russian State Historical Archives in St. Petersburg and published in Apollo, February 1991, indicates that in a document dated April 7 (OS), 1892, the tsar had been presented with “an Egg, jade with roses (rose-cut diamonds), an elephant and three angels-4,750 silver rubles.” Fabergé’s bill was delivered on May 6 (OS), of the same year. Lopato says the egg described is the Diamond Trellis Egg. She cites photographs taken at the Fabergé Artistic Objects and Miniatures Exhibition held March 1902 in the Baron von Dervis Mansion on the Angliskaia Naberezhnaia (Editor’s note: English Embankment) in St. Petersburg. 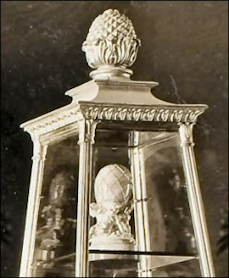 Extant photographs clearly show the pyramidal showcase to the rear, in which the objects belonging to the Dowager Empress Marie Feodorovna were exhibited; on the upper shelf stands the Diamond Trellis Egg on a round stone pedestal supported by three naked putti. Fabergé, Proler, & Skurlov in Fabergé Imperial Easter Eggs (London, 1997) suggest the three cupids represent the sons of Tsar Alexander III and Marie Feodorovna, namely, Grand Dukes Nicholas (later Tsar Nicholas II), George, and Michael. The elephant mentioned was the surprise inside the egg. At present, the egg exists alone in the Dorothy and Artie McFerrin Collection. The pedestal is either lost or survives elsewhere. The pedestal, but not the surprise, was still with the egg when it was sold by Sotheby’s London, on December 5, 1960. The catalog description includes the line …supported on the backs of three silver putti who are seated on a grassy mound ¦ There is an accompanying illustration of the egg with its pedestal of three silver putti. Toby Faber in Fabergé Eggs: The Extraordinary Story of the Masterpieces that Outlived an Empire (London, 2008) says the Diamond Trellis Egg was …subsequently separated from its genuine stand by Emanuel Snowman in [the] mistaken belief that this was a later addition. The elephant appears on the coat of arms of the Danish Royal family, and Marie, of course, was a Danish princess. The reference to the elephant being …clockwork suggests it was the first automaton used by Fabergé in a Tsar Imperial egg. Apart from being the first known automaton surprise used in a Tsar Imperial Easter Egg, this mechanical elephant is seemingly among the first automata made by Fabergé. In comparison with the mechanical devices used in the 1906 Swan and 1908 Peacock Eggs, this automaton is almost primitive. But it is yet another example of Fabergé and his workforce trying something new and which, over time would be extensively and exquisitely refined. The automaton elephant this theme would be repeated eight years later in the 1900 Pine Cone Egg made for Barbara Kelch, neé Bazanova ,was the daughter of an extremely wealthy Moscow merchant family. In 1894, she married Alexander Ferdinandovich Kelch, a titled gold magnate and industrialist. In the years from 1898 to 1904, Kelch presented to his wife eggs quite on a par with their Imperial counterparts. 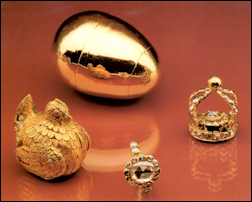 Tatiana Muntian’s research in von Solodkoff, Fabergé: Juwelier des Zarenhofes (Hamburg, 1995) quotes the 1917 inventory of confiscated Imperial treasure as including the …brilliant grill (-work/trellis) egg of 1892 – an egg of nephrite in gold setting, with a brilliant-covered net, base of nephrite with three silver putti. The 1922 inventory of confiscated Imperial treasure includes as a separate entry, …Ivory model of an elephant in gold setting with rose-cut diamonds and diamonds. According to Caroline de Guitaut, the newly discovered automaton surprise is almost identical to the badge of the Danish Order of the Elephant, the most senior order of chivalry in Denmark, except it is made of ivory rather than white enamel and incorporates a mechanism. The elephant is wound with a watch key through a hole hidden underneath the diamond cross on one side of the elephant. It walks on ratcheted wheels and lifts its head up and down. It is possible the Diamond Trellis Egg is one of two Fabergé eggs referred to in an article by Alexander Mosyakin, …The Sale: Our Country’s Great Loss, in the Moscow newspaper Ogonyok, No. 7, February 1989. Mosyakin refers to two eggs both of …jadeite (sic) with dozens of brilliants being sold for $450 each. This sparse comment could be a rough description of the Diamond Trellis Egg. The description probably should refer to rose-cut diamonds, not brilliants. However, it is difficult to see how an egg with …dozens of brilliants could be worth only $450. The surprise has been lost and is not detailed in Fabergé’s bill. Shortly before the Forbes Magazine Collection sold its Fabergé eggs to Viktor Vekselberg, Christopher Forbes suggested the Resurrection Egg (1885-1895) may be the surprise for the Renaissance Egg. 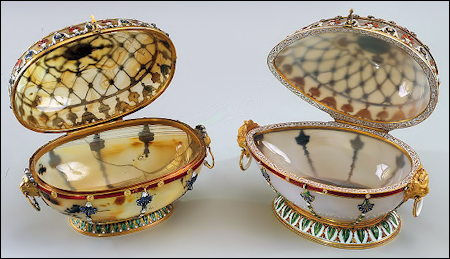 The invoice mentions pearls, and since they are not evident on the egg itself, they may have been used in the surprise: “Agate egg, gold mounting, enameled in the Renaissance style, with diamonds, rose-cut diamonds, pearls and rubies.” (Fabergé, Proler, & Skurlov, Fabergé Imperial Easter Eggs, London, 1997) The Resurrection Egg does include pearls. Debate continues among scholars. This is one of the few Imperial eggs designed to sit sideways. Another is the 1907 Tsar Imperial Love Trophies Egg. The Easter after the death of Tsar Alexander III in 1894, his son Nicholas II as the new Tsar, presented Fabergé Easter eggs to his mother, Marie Feodorovna, and his wife, Alexandra Feodorovna. Click HERE for a printable PDF of the above four tables. Works of Carl Fabergé’s contemporary stone carvers and origin of their art, as well as their role and place in the world’s art history. Caroline de Guitaut, Senior Curator of Decorative Arts, Royal Collection Trust, London, was the headline speaker for the event also open to the public. 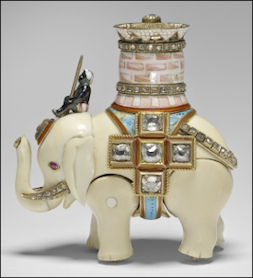 Her topic – “East and West: Russian Lapidary Art and the British Royal Collection” included the announcement that the missing elephant automaton surprise of the 1892 Diamond Trellis Egg was found. Presenters for the symposium are listed on the event program. An illustrated collection of reports based on the conference results is to be published. The Artie and Dorothy Fabergé exhibition will be continuing through 2016. Jewelers of St. Petersburg, Russia. Tim Adams, independent art historian, reviewed the book, Floral Jewels: From the World’s Leading Designers, written by Carol Woolton, jewelry editor of British Vogue, for Gems & Gemology Magazine published by the Gemological Institute of America. 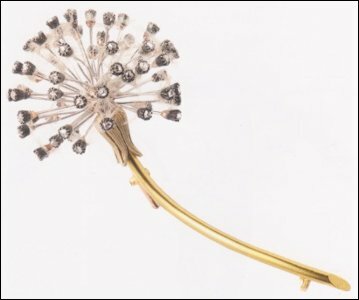 Fabergé used asbestos fibers to create the light and airy naturalistic look of a dandelion blossom. The fibers are wrapped around a metal stem then secured with a small diamond cap or finial which is screwed on the end of the stem. Geoffrey Munn, author of Wartski – The First One Hundred and Fifty Years, is featured in an interview with the Jewish Chronicle Online, August 28, 2015. Ulla Tillander-Godenhielm, a recognized expert of pre-revolutionary St. Petersburg jewelry history, has been studying the diaries of Alexander Edvard Gustavovich Tillander, and Alexander Theodor Alexandrovich, her grandfather, both gentlemen in two generations were known as Alexander Tillander. The diaries offer a unique insight both into the professional and personal life of a St. Petersburg jeweler with a myriad of particulars from this fascinating world of craftsmen, collaborators and illustrious clients. On August 27, 2015, she lectured on this topic – “From St Petersburg to Helsinki. The Saga of the Tillander Family of Goldsmiths”- at the St. Petersburg Fabergé Museum. A book based on her research will be published in English and Russian in the near future. – Fabergé Revealed Corrections report the results of recent gemological assessment and X-ray fluorescence spectroscopy to aid in the precise identification of the various materials used for individual objects. Lowes, Will and Christel Ludewig McCanless, authors of Fabergé Eggs: A Retrospective Encyclopedia, 2001, are publishing their new research and updates for 50 Imperial Easter Eggs in the Fabergé Imperial Egg Chronology of the Fabergé Research Site.